This is one recipe where you just can't go wrong. I mean, this is steak we're talking about. The accompanying photo is not the best, but that's only because I used a cameraphone. 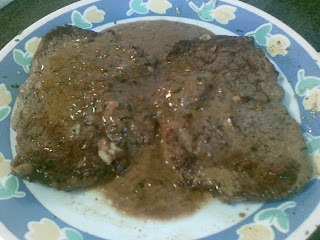 Flatten and tenderize the steak pieces. Spread the garlic over both sides of each steak and grind over the pepper. Heat half the butter in a frying pan. Cook the steaks over high heat for 2 to 3 minutes to seal each side, turning only once. Remove the meat from the pan; cover and keep warm. Heat the remaining butter in the pan; add the spring onion and cook for 1 minute. Add the mustard, Worcestershire sauce and brandy. Stir to dislodge any crusty bits from the base of the pan. Stir in the cream; simmer for about 3-4 minutes, or until reduced slightly. Stir in the parsley. Return the steaks to the pan unitl just heated. Serve immediately with the sauce.